Rob Richards has a lot of reforms he'd like to see in Olympia, city government structure wise. Some of his ideas are pretty interesting (like hard wiring advisory boards into city decision making), but one of them seriously caught my interest. Rob said that we should elect city council-members by district, rather than at-large. He doesn't really get into saying exactly why, but I'm reading into it that its likely because city councilmembers now are concentrated in one or two parts of town. I'm not sure this is true. Last year I tried to go back as far as I could to see what neighborhoods city councilmembers came from, but I got bored looking through the city guidebooks at the library after a few elections. Either way, council districts Rob laid out are pretty simplistic. Basically, he draws one down the middle (downtown and South Capital) and then Northeast and Southeast and Northwest and Southwest on each side. At first glance I thought Rob's districts would be way out of balance, especially the middle one. Hardly anyone actually lives downtown right now and South Capital wouldn't be big enough to bring that district into balance. I used Dave's Redistricting Tool (which is pretty cool) to draw five districts around 9,300 voters each. I didn't land any of the districts on the nose, but I got as close as I could. To really get close, we'd need much smaller voting precincts. Districts this small can't be very precise. Generally speaking, this is the same map as Rob's, one district downtown and then two on each "side" of downtown. 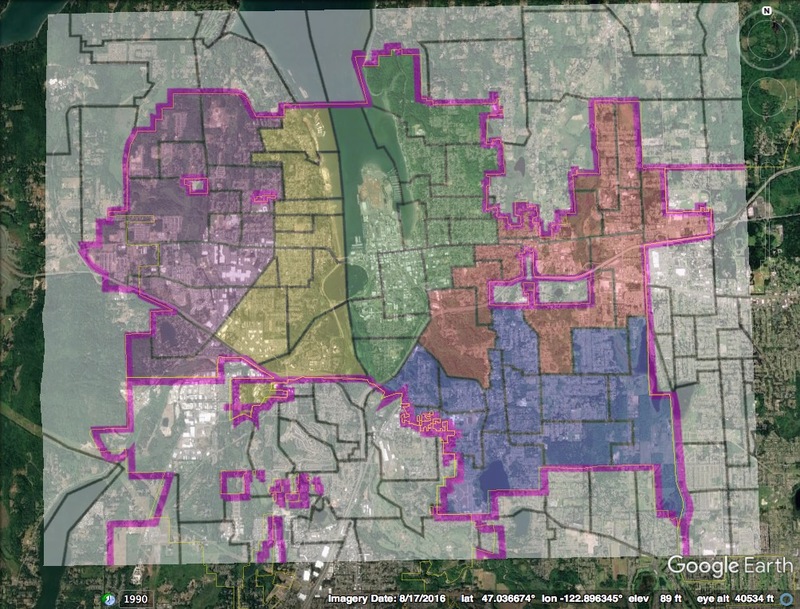 The difference here is that the downtown district also includes much of the older Eastside. Also, I split the westside to inner and outer districts. It worked balance wise, but I also think it worked culturally. 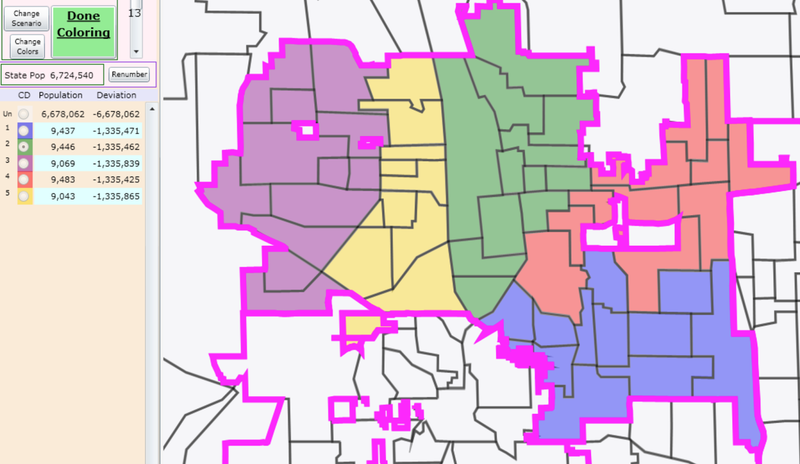 If the point of districts is to give each different part of town a voice, the real split on the west side is the older neighborhoods and the new ones west of Division.